Giant Pumpkin Growing Tips From The Pumpkin Man: Last of the Aminos, Some RAW Bloom & the S-curve. Last of the Aminos, Some RAW Bloom & the S-curve. I sprayed on the soil the last bit of the Aminos that was left over in the sprayer from the last application on the soil this evening along with some RAW Bloom (3-12-12) as a foliar application. I had mentioned previously that I've cut back this year on foliar applications. I'm probably doing half as much. I do think there is a place for foliar, to get nutrients into the plant where the roots may not be able to get everything up because the nutrient is bound up in the soil. I also think that foliar applications can be hard on the leaves and you'll have happier leaves at the end of the season with minimal foliar applications. It is kind of a balance. This time of the year can be the most demanding on a grower. Vine burying should be a priority along with weed maintenance. The warm moist soil is very favorable to weed germination and it is easy to get behind on weeding when the vines are growing like crazy and you have to spend a fair amount of time on the vines. Particularly not fun when it is 90 degrees and your body says to go into the cool air conditioned house, but your heart tells you that to grow big this hard work will pay off. What you kind of have to remember is about 24-28 days after the pollination that pumpkin should really start taking off. When that happens the vine growth typically slows down a fair amount and life gets easier again. But from about June 7th to July 21st, it is hot and dirty work. The men from the boys get separated at this time of the year. Then you hope you got a plant(s) that can make all of the hard work pay off. At this time it is also time to start the S curve in your vine at the pumpkin. 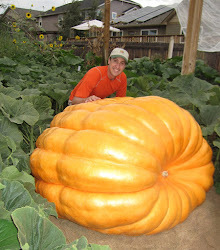 As the pumpkin grows the fine can grow into the pumpkin and eventually snap it off if your vine isn't curved. Here is a picture of a female flower from previous year that is going to open the next morning. 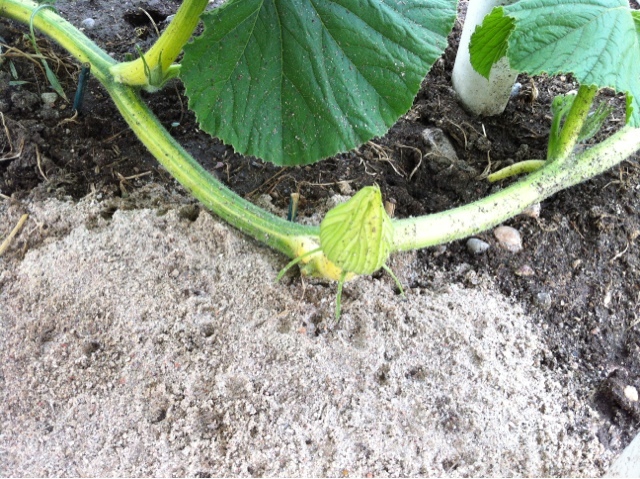 You can see that I've started the curve in my vine in advance of the pumpkin growing. This is typically done in the heat of the day over days. Eventually I'll have that pumpkin on the point of the vine with the vine curved even more over the next 3-5 days. Doing this early saves you a lot of headaches later. I've never really perfected my technique for this. Still usually have to have a strong friend help me pull the pumpkin back to get it away from the vine a month or so later.